Nintendo’s beloved pink blob Kirby is making quite the debut on Nintendo Switch with Kirby Star Allies. While Kirby’s recent handheld adventures, like Kirby: Planet Robobot have been great, the last couple console outings, like the Wii U’s Kirby and the Rainbow Curse, have been pretty disappointing. Fortunately, that changes with Kirby Star Allies. 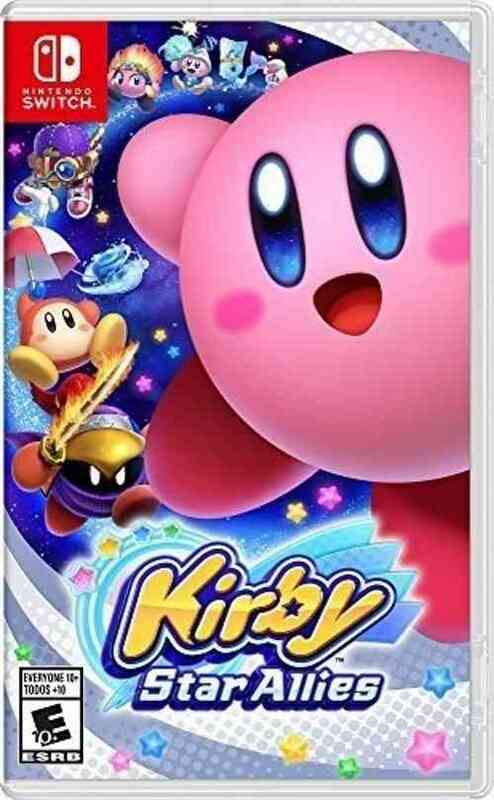 Featuring a more traditional Kirby-style side-scrolling adventure with a 2.5D perspective and up to four-player local co-op, this is one Kirby game that fans have been clamoring for. Kirby Star Allies features a brand new adventure filled with new and familiar faces and locations. It begins with an explosion above Planet Popstar which drops purple, heart-shaped gems through-out the world of Dream Land. These heart-shaped gems infect everyone who touches them, including Kirby’s nemesis, King Dedede. Kirby soon discovers he has the new ability to enlist the help of additional allies – including enemies! With his new team of Star Allies, Kirby will travel through a series of colorful worlds to restore the peace. On the surface, Kirby fans will be right at home. Kirby can still inhale enemies, and depending on the type of enemy, Kirby can absorb their abilities to use. Where Kirby Star Allies deviates is the cool addition of Star Allies. Kirby can give a heart to most enemies, and they’ll join his crew. You can only have three additional allies, but you can switch allies out pretty easily. To take it a step further, certain allies can combine their abilities to create various combinations. For example, if Kirby has a sword ability and his ally has a fire ability, Kirby can turn his sword into a flame sword. My absolute favorite combination was when Kirby has the rock ability and combines it with an ally who has either an ice or water ability. This combination turns Kirby into a curling rock that slides along the immediate path smashing into enemies. If this was what curling was really like, I’d definitely watch it far more often! 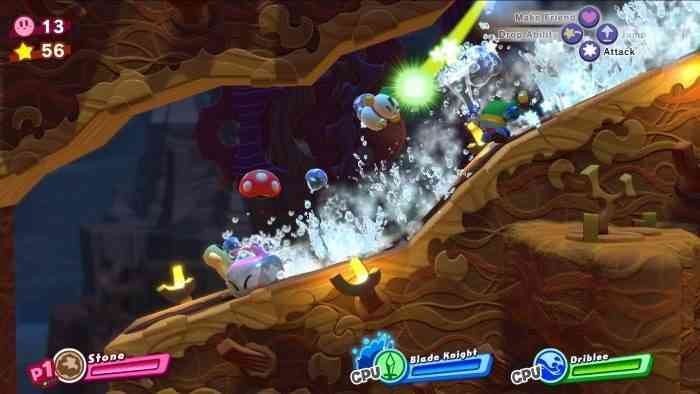 Kirby Star Allies has three main over-worlds to explore, each with a handful of levels and unlockable secret levels. The amount of fan service in Kirby Star Allies is just amazing. For example, once you unlock the Dream Palace, you’ll be able to recruit some of Kirby’s most famous friends, and enemies, as Star Allies (I won’t spoil who shows up). Nintendo has also announced that free downloadable content will bring even more Star Allies to join Kirby’s adventure. If you’ve been enjoying Kirby games since his 8-bit beginnings, then you’re in for a treat with all the secrets, levels and characters that show up from past Kirby adventures. Kirby Star Allies is playable for up to four players. Each player only needs one Joy-Con controller and can drop in at any time. 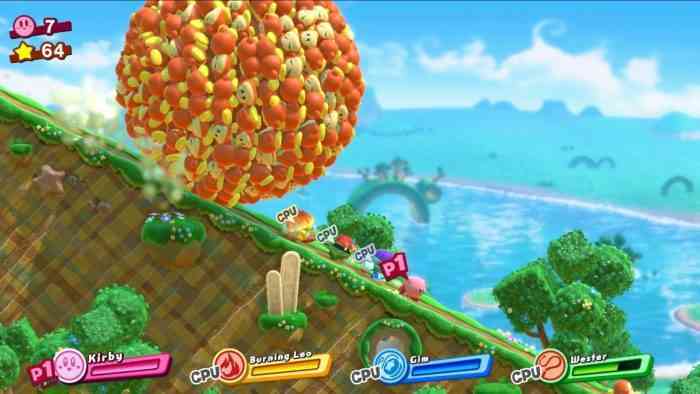 Player one, who’ll play as Kirby, will be the primary focal point for the game, so any other players who deviate too far away will warp right back to Kirby. However, the advantage of playing as player two, three, or four are all the cool characters you can control such as the Dream Palace Star Allies! 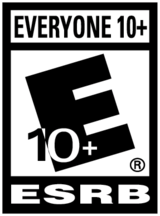 It’s worth noting that multiplayer is local only – no online features here. As an added bonus, Hal Laboratory has included a mini-games into the mix that are fun little time wasters. They’re like Kirby versions of Mario Party mini-games that up to four players can join in on. Chop Champs has you racing against your opponents to chop as much wood as you can while avoiding bugs. It’s not great, but worth a play through. Star Slam Heroes, on the other hand, is much more enjoyable. You’ll have to time your button presses to build up your swing meter and then hit an incoming meteor at the right time to send it light years into space. There are other mini-games, but I’d hate to spoil them for fans here. Let me make something abundantly clear, I had a ton of fun with Kirby Star Allies (even more so when I played multiplayer with my son). Kirby Star Allies provides the Nintendo Switch with a very solid Kirby adventure that’ll be a sure hit for fans of Kirby’s past adventures. With four-player local support, you’ll definitely want to ensure you have some buddies over to fully enjoy this title. It’s not an overly long game, clocking in at six or so hours depending on how much time you spend seeking out the various secrets. But the secrets are definitely worth hunting down as there are some pretty nostalgic bits hidden in there. Nintendo has announced some free downloadable content in the form of new Star Allies, but I hope they grace us with some new worlds/levels down the road too, even if they’re paid DLC. The game features amiibo support, but hardly worth noting – only offering some added health and puzzle pieces (which you’ll use to unlock hand-drawn art pieces showcasing Kirby’s history). If you’re a fan of Kirby games or looking for a solid side-scrolling platformer, then you really can’t go wrong with Kirby Star Allies.